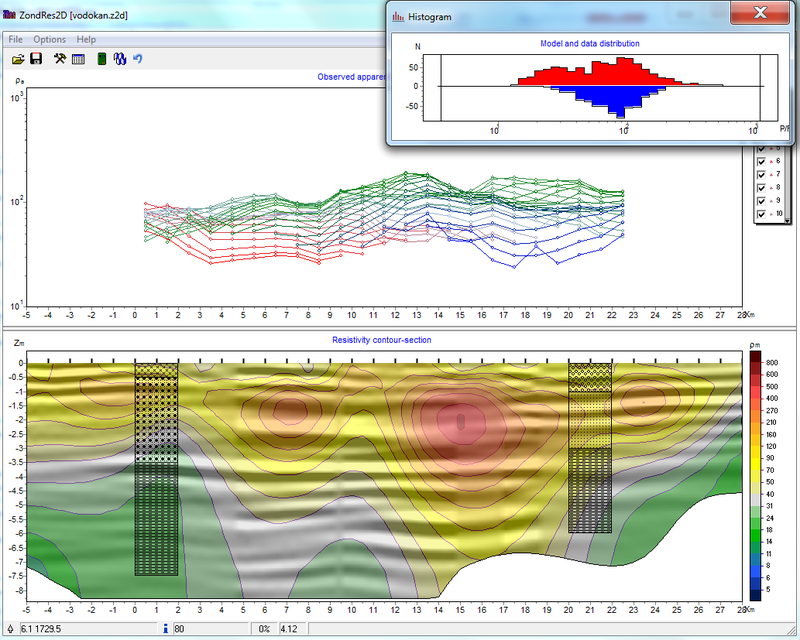 Zondres2d program is designed for two-dimensional interpretation of electrical tomography data by resistivity and induced polarization method in land, cross-borehole and water cases. Electrical tomography (Resistivity imaging) is technique including both the method of field observations and technology of processing and field resistivity and IP data interpretation. Its feature is multiple reusing as a source and receiver just the same electrodes position, fixed on a profile line. Such approach allows from one hand to work with a modern high-performance instruments, and on the other hand, to apply effective algorithms of modeling and inversion of resistivity and IP data. 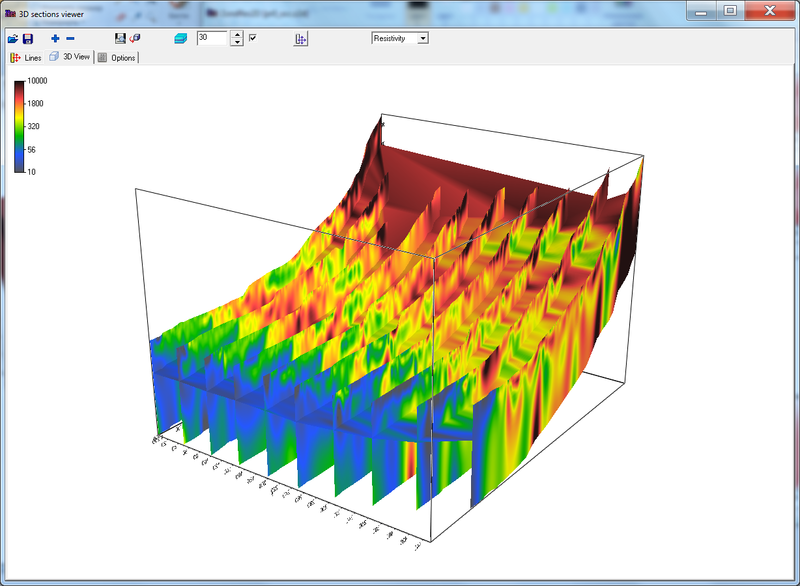 For interpretation(inversion) of electrical tomography data is used two- and three-dimensional models. It significantly extends the range of electric prospecting solved problems due to sections investigating that are considerably different from «classic» horizontal-layered. Resolution and thus results quality of electrical tomography is closely connected with the number and density of measurements on the site. Their number usually reaches first thousand that is why the question of field measurements efficiency has basic importance and in many aspects defines possibility of practical using of this method. Special instruments with programmed automatic switching of electrodes is applied for reaching of maximum effectiveness of field works. ZondRes2d represents ready solution for resistivity and IP imaging, and solves wide range of problems from mathematical modeling and sensitivity analysis to quality control, field data processing and 2D inversion. Convenient interface and variety of data visualization features allow to solve wide range of geological problems with maximum effectiveness. 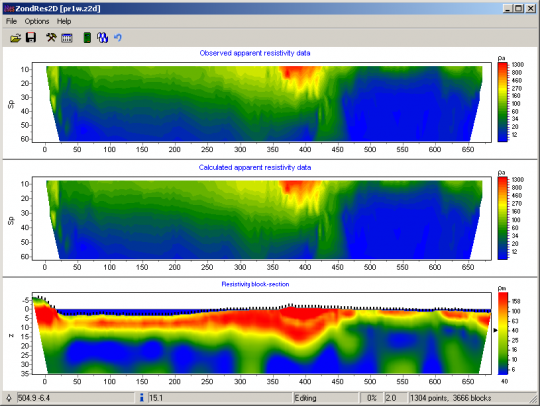 ZondRes2d uses simple and clear data format which allows easily combining various systems of observation, including different variants of the topography setting up and other additional information. The software works with any (applied in electroprospecting) types of electrodes arrays (two, three and four – electrodes) or their combinations. It’s also support most popular formats AGI, ABEM, MAE-instruments, ARES, Zonge, Res2dInv, Syscal, Sens2dInv. Important stage which precede field measurement is mathematical modeling of geoelectric structure of work site. Modeling gives a chance to estimate the level of signal and to make a choice of optimum parameters of the observation system for decision of formulated geological problem. ZondRes2d has great range of tools for mathematical modeling and analysis of DC (direct current) and induced polarization fields. As the general task of the program is inversion of geoelectric parameters, some variants of inverse problem decision are realized in ZondRes2d, basic of them are: smoothing inversion – to get smooth model and focusing – to get piece-smoothed model of geoelectric parameters with depth. While program was designed special consideration given to a priori data accounting. Because of equivalence of inverse geophysical problems, quality of the obtained results strongly depends on the amount of a priori data used. In ZondRes2d there is possibility of weights setting for measurements, fixing and limits making of changing features of different cells, using of a priori model as reference in inversion. The robust schemas of noise estimation are realized in the software. There is also possibility to import and display results of measurements by other methods and logging and boreholes data that improved quality of results. Both 32 and 64 bit versions are available. Support any electrodes arrays or combinations with arbitrary system of spacings and electrodes positions. The possibility to work with different (number of electrodes) arrays on the same site. Four ways for specifying topography. Real-time editing. Setting of strike parameter. Two ways for induced polarization inversion. Standard scheme (static IP) and full waveform IP inversion for cole-cole parameters (time and frequency domain). Approximate and full solution. Time-lapse inversion. Script recording for multi-files processing. Special options for large scale problem. 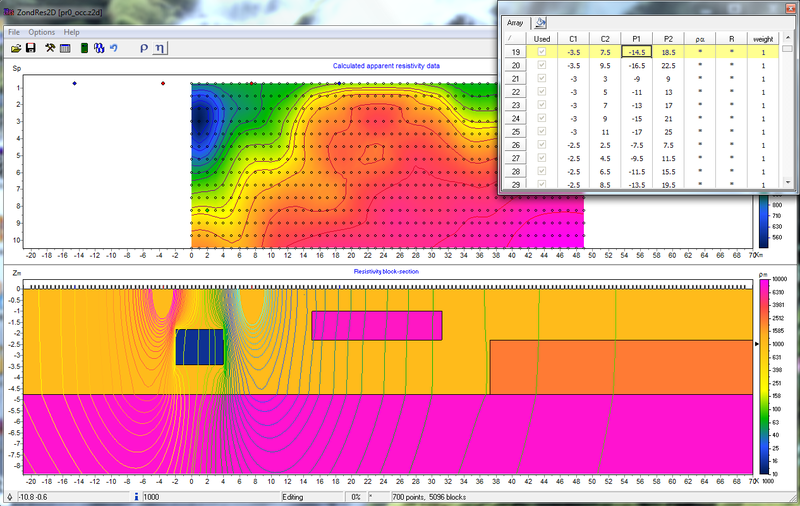 Resistivity and IP data quality control, denoising and editing data module, EM removing. A set of tools for mathematical modeling of geoelectrical section. Standard mesh “bitmap” style, arbitrary layered model and polygonal style model. Additional tools for gravity, magnetic and self potential forward modeling and joint inversion. Number of the resistivity and IP inversion algorithms : smooth, focusing, robust, block. Setting the reference model for the inversion. Suppressing of the noise component during inversion (robust reweighting). Suppression of P / C static shifts during inversion. Working with anomalous arrays MAN AMNA (method of true anomalies). Setting of limits for models parameters, inserting of a priori geological boundaries and borehole data to inversion. Assignment of weights for datum records. Editor of measurements. Estimation of results quality based on sensitivity matrix analysis. Calculation of sensitivity, quality and DOI index. Cutting of the model edges : by angle or sensitivity level. Number of variants for data, model and apriori information visualization. 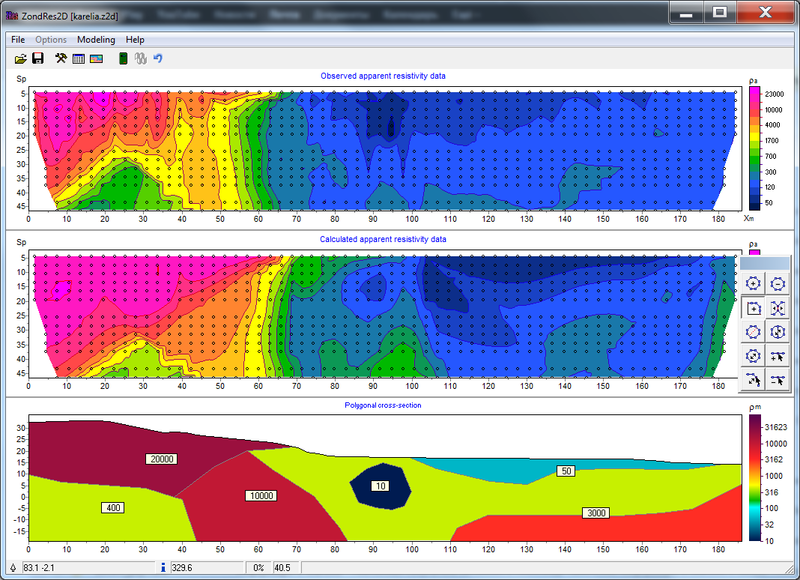 Ability to set a semi transparent background for the resistivity section (geological, seismic sections). 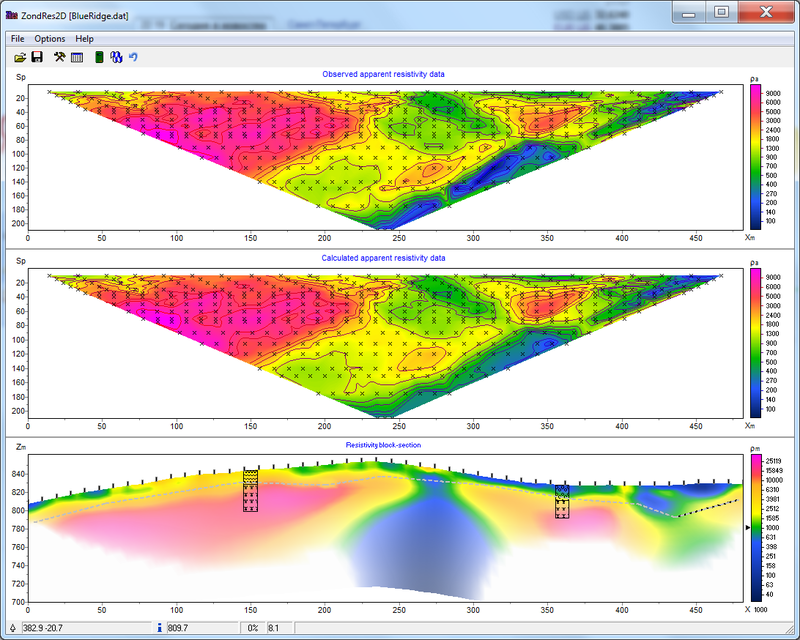 Three-dimensional visualization of the geoelectric sections along arbitrary system profiles. Maps slices of parameters for various depths. Geological sections editor and borehole columns editor. Titled boreholes. 2D joint inversion with magnetotelluric, refraction seismic and TDEM data.